Masala Vadai - Paruppu Vadai, today's post is my favorite masala vadai. I always prefer masala vadai when compared to medhu vada but my husband is totally opposite :p. He always prefer medhu vada or mysore bonda. As any other recipe, there are lot of variation in making masala vadai. The one I am sharing here is my Mom's version. We might try lot of versions in making the dishes but we should admit that nothing can beat our Mom's preparation. Hope you guys agree! Chana Dal/ Kadala Paruppu - 150 gm. 1. Keep all the ingredients ready to make masala vadai. 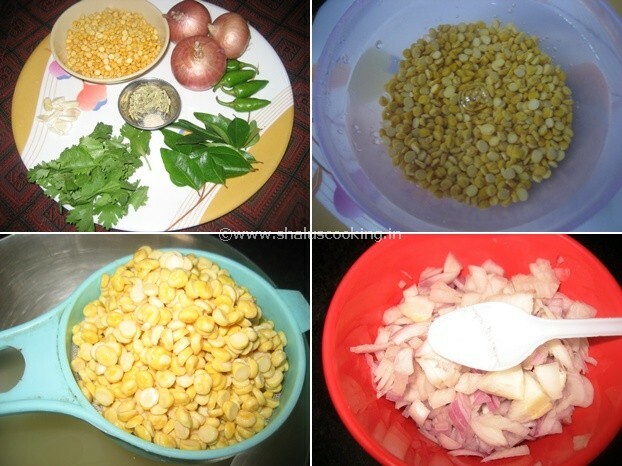 a. Soak the chana dal in water for about an hour. After one hour, drain the water and keep the dal ready. b. Finely chop the onion and add little salt and mix it well. 2. Take a blender and add green chilies, curry leaves, coriander leaves, garlic cloves, fennel seeds and asafoetida. Grind it to make a coarse paste without adding water. 3. Add the soaked dal to the ground mixture and grind it to a coarse paste by adding very little water. 4. Take a wide bowl, add the ground dal mixture and chopped onion and mix it well. Adjust salt if required. Make small balls out of the vadai mix. 5. Heat oil in a pan for deep frying the vadai. Press each ball in between your palms to make vadai and slide it one by one into the hot oil.. Flip it and fry on both sides till the vadai is cooked on both sides and becomes brown and crispy. Once done, drain the oil and transfer it to a paper towel. Tasty and crispy Masala Vadai - Paruppu Vadai is ready to serve. Enjoy it hot as a snack with a coffee or tea.